This is a 92 piece interior screw kit for 1979-1981 Camaro. 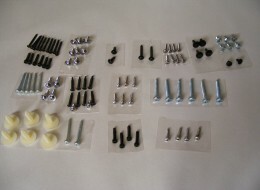 Available for Hard Top and Fisher T Top cars. NEW OPTION: All Black or All Chrome. Please specify when ordering. 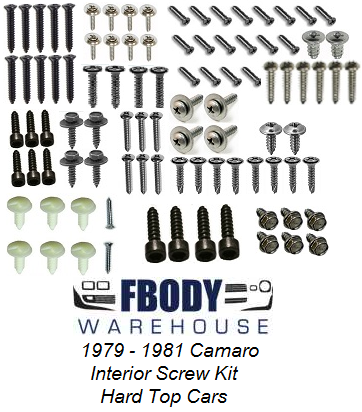 This is a 92 piece interior screw kit for 1979 -1981 Camaro. This is by far the best kit available in the industry. 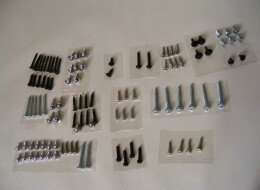 Your screw kits have been developed "In House" meaning we have checked the counts and styles of all fasteners from true donor cars. In the past decade we have dismantled over 700 70 - 81 models and taken that insight and create the best kit you will find any where!